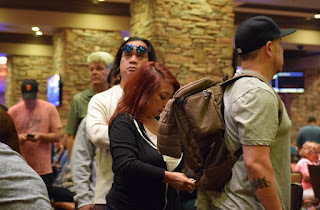 44 players remain in Day 1B of the Catapult. Players finishing 23-27th place cash for $300 while play ends for the flight when down to 22 (8 percent of the starting field). Those 22 bag-n-tag to come back Sunday at 1pm for Day 2 and play down to a winner. Meanwhile over at Day 1C, there's about 20 players in line at registration buying in during the first level of play. Registration is open for six 20-minute levels plus first break.